A "major pollution incident" is thought to have killed thousands of fish, Natural Resources Wales (NRW) has said. 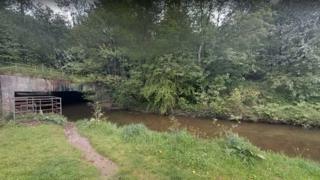 A stretch of about 9km (5.5 miles) of the River Clywedog near Wrexham has been affected. Officers from NRW have been investigating the incident since Tuesday in a bid to find the source. Anthony Randles, from the environment body, said: "The pollutant has had a significant effect on fish and river life." He added: "Our officers remain on site to collect water samples for analysis and to assess the impact on the environment and wildlife. "We will continue to investigate how this pollution happened and will take appropriate enforcement action if necessary."